The Online Encyclopedia of Integer Sequences (OEIS) is a useful resource for my Tintinnabuli Mathematica music project. For each sequence, the OEIS lists the first few terms and describes the algorithm that produces it. I use these algorithms to generate number sequences of various types (regular, fractal or chaotic), which I then translate into musical notes and output as MIDI files using a program written in Mathematica. The sequences in the video were chosen because they were interesting or mathematically important in some way. This interestingness could be intrinsic (e.g., it relates to a known sequence, or it makes a nice pattern) or relative to the other sequences chosen (e.g., it is different to the others). It turns out that this interestingness also affects the OEIS itself as a whole. Using mathematical tools to investigate the OEIS reveals that this ostensibly objective and mathematical project is also shaped by cultural factors. Philippe Guglielmetti (2009) investigated the frequency N(n) with which each integer n appears in the OEIS. 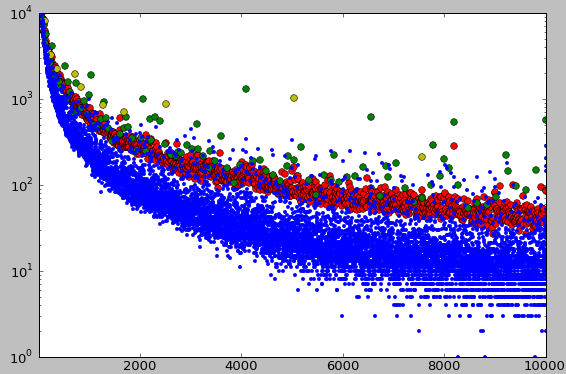 He plotted this as a graph, showing on a logarithmic scale how many times each number up to 10,000 occurs amongst all the sequences in the OEIS. 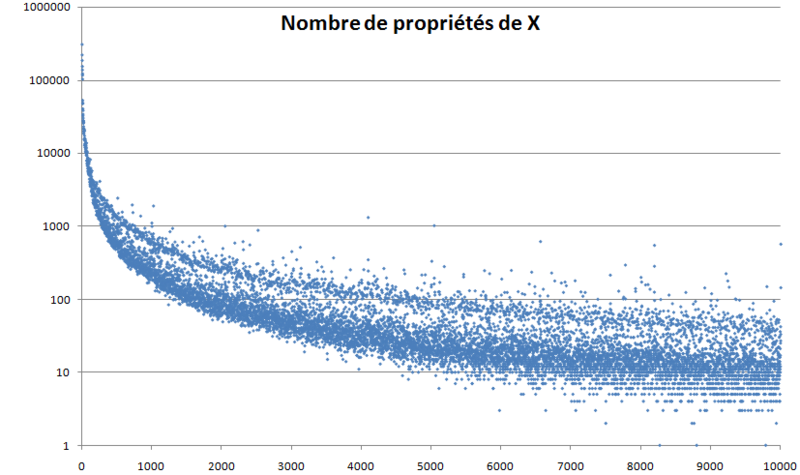 As we would expect, smaller numbers occur more frequently than larger numbers, creating a logarithmic downward curve. Guglielmetti observed that the integers are divided pretty clearly into 2 groups, noting that there are fewer “interesting” numbers in the upper band, and more common “uninteresting” numbers below. The interesting numbers include the prime numbers (red in the image below), numbers of the form a^n (green), and highly composite numbers (yellow). There are relatively few “slightly interesting” numbers in the middle, and this area is known as “Sloane’s gap” after the creator of the OEIS. Gauvrit et al. hypothesize that the gap is the product of the social aspect of the OEIS, caused by mathematicians’ greater interest in numbers of high and low complexity, and lesser interest in those of medium complexity. This study also considers which is the smallest number that doesn’t appear in the OEIS – that is, the smallest integer n for which N(n) = 0, or the first number that is mathematically un-interesting. Paradoxically, this makes it quite interesting. Appropriately, the idea of the smallest uninteresting number was discussed in an episode of QI (broadcast November 2011), which pointed out that such a number is culturally, rather than mathematically, interesting. In August 2008, the smallest number not to appear in the OEIS was 8,795, and in February 2009 it was 11,630, changing as new sequences are added. This entry was posted in Complexity and tagged integer sequence, Mathematica, mathematics, OEIS, Sloane's gap, tintinnabuli. Bookmark the permalink. Nice idea, Ryan. Thanks for sharing. Am I right in thinking that you added the sequences (in batches) in order of their OEIS number, so that the temporal dimension represents the historical growth of the OEIS?